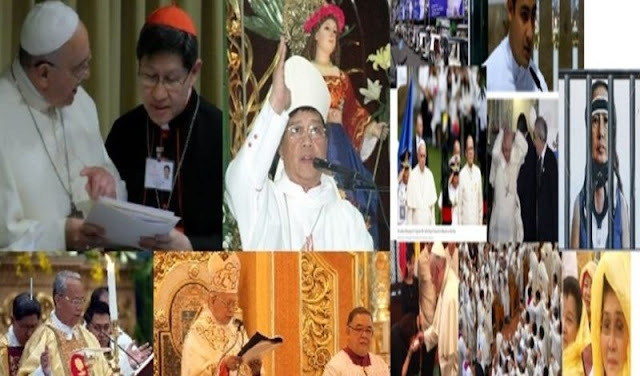 The Philippines is being manipulated by the Vatican through its exploitation of the Roman Catholic church, accorcing to the blogsite Infograpix. "The church is the people and the head of the church is Christ, not the Vatican. But many Filipinos revere the Vatican and take whatever the Vatican says as divine- the same Vatican involved in many atrocities throughout time," it said, adding that the problem is the people see the Vatican as the head of the Roman Catholic church, which is incorrect. It said that the Vatican almost made a martyr out of the scientist Galileo Galilie. In the Philippines and that its hands are stained with the bloodof Gomburza and Rizal. The blog added that anyone who would review Philippine history would "see the dark silhouette of Vatican behind the death of Rizal," adding that Rizal had given no reason to be executed, and yet he was, because the Vatican interest was stringer than Spain. It added that one more death caused by the Vatican was that of late Senator Ninoy Aquino on August 21, 1983. The blog said that the death was caused by Danding Cojuanco, who had a "multi-Trillion dollar reason" to kill the late senator. The blog then added a messaged to the Vatican, "You collaborated with the Americans to annihilate the Filipino republic when you had no more use for Spain to secure the gold for yourself. Your silhouette draped the assassination of our supposedly future president before, Sen. Benigno S. Aquino Jr.--- a scheme that toppled Pres. Ferdinand E. Marcos who took the control of Philippine gold from your hands. The souls of our patriots have become immortal and have seen the end of your treachery." The writer said that the Vatican had interest in Philippine gold. "It became complicated when Col.Severino Santa Garcia Romana aka Fr. Jose Antonio Diaz, at the onset of World War II, started securing the gold and worked with the United States OSS (the precursor of the CIA) along with the young lawyer Ferdinand E. Marcos. From that time on, many stories came up on where the gold was transfered and deposited. Eventually facts about Philippine ancestral gold were mixed with the so-called Yama$hita treasure. Today, banks around the world holding gold traceable to the Philippines are torn between two claimants: the Diaz umbrella and the Marcos umbrella. Both, I believe, are having a hard time in fully controlling the said wealth because the banks seem to be exercising some form of moral restrain in releasing the assets to anyone. The banks still want to know the assets' true owners and origin," he said. "The question of true ownership can be helped resolve if the Vatican steps into its centuries old obligation and releases its very old secret inventory of Philippine ancestral wealth," he added. The following is a timeline in the article of alleged evidence of the events which prove the Vatican's participation in history, for the acquisition of gold, starting from World War II until the event in 2005 where 5,000 metric tons of gold were shipped out to Europe and the bullions were accidentally found by a farmer somewhere in Mindanao, with another 2,000 shipped to Thailand.